An article was published on courant.com on June 13th, 2016. To read the fill article, please click here. 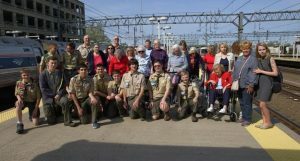 Residents from The Watermark at East Hill joined by Boy Scouts from Troop 158 and 58 set out on a three-day trip to Washington. As part of a pilot program designed by Jim Bain, Director of Dining Services and Denise Julian, Director of Health Services at The Watermark, the program seeks to create intergenerational opportunities. Part of the funding for the Scouts’ trip was funded by Watermark for Kids, a national nonprofit organization that provides awards for children to learn, grow, thrive and pursue their interests and passions.